SNES Super Mario All-Stars: The Lost Levels (USA) "warpless, Mario" in 34:36.61 by HappyLee. 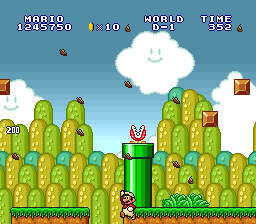 The Lost Levels is a remake of the game released in Japan as Super Mario Bros 2. It introduces a number of new obstacles into the standard Super Mario Bros. formula, including poisonous mushrooms, wind, reverse warp zones, and of course many tricky jumps. It's difficult enough that Nintendo of America decided to completely re-theme a different game and release that as Super Mario Bros. 2 instead; The Lost Levels is the first time the Japanese sequel was released to the rest of the world. This movie saves 164 frames over previous publication. All levels are played, including the secret world 9, and the extremely difficult A through D worlds.